Dr. Koenitzer is an in-network provider with Delta Dental PPO plans. Delta Dental offers enrollees several different coverage plans. Our front office team will be glad to help you understand the benefits provided under your plan. In addition, feel free to call us to determine your coverage for any specific type of procedure that you or another member of the family is scheduled to have in our office. If you have Delta Dental PPO you can see any licensed dentist you choose. However, you will probably be able to save some money when you visit a Delta dentist in Petaluma that is in-network such as Dr. Koenitzer. With DeltaCare USA, you choose a primary care dentist from the network. As an in-network dental care provider, we will submit a claim after your visit and will not bill you more than the approved amount. If you visit a non-Delta Dental dentist, you may be responsible for paying your dentist the full amount and then submitting all claim forms yourself. While Delta Dental insurance plans differ slightly from one another, there are some fundamentals that apply to all plans and even dental insurance in general. Here are some common insurance terms. Maximum. The majority of dental plans have a top dollar amount that your insurance company will pay toward the cost of dental care within a calendar year. If you exceed the annual maximum then you are responsible for payment. Usually, your dentist in Petaluma can schedule on-going treatment so that you don’t go over the maximum. Deductible. Delta Dental insurance plans have a specific dollar deductible that is similar to your auto insurance. This means that at the start of the benefits period—usually January 1st of any calendar year—you must pay for a portion of your dental bill before your benefit plan will begin to cover the cost of dental treatment. Coinsurance. Coinsurance is often called a copayment. This is an out-of-pocket cost that you must pay. Delta Dental pays a percentage of the cost for a specific procedure and then you pay the balance, or coinsurance. You must pay this even after you’ve satisfied your deductible. If you need to have extensive dental care, then you may need to budget for the cost. 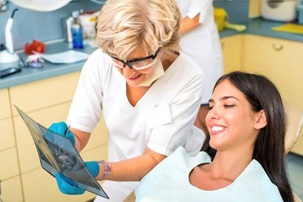 In this case, your dentist in Petaluma can submit a pre-treatment estimate, which shows how coinsurance, deductibles and maximums could affect your out-of-pocket expense. Although this estimate is not a guarantee of payment by Delta Dental, it can help you prepare for your share of the cost.